The Roughnecks came out of Uncasville, Conn. with a 13-12 overtime loss to the New England Black Wolves on Sunday afternoon. 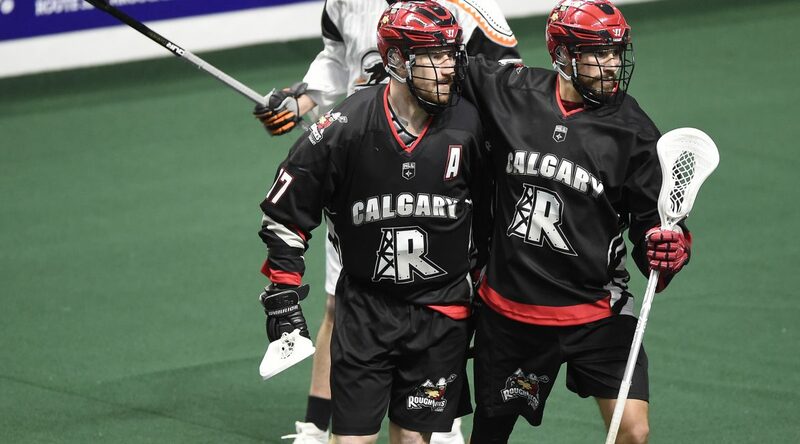 Two notable milestones for the Riggers during Sunday’s game: All-time franchise points leader Dane Dobbie surpassed the 500-career loose ball milestone after notching 12 during the tilt. Meanwhile, Christian Del Bianco stood tall between the pipes stopping 33 of 46 and recording his 500th career save along the way. Three Riggers notched hat-tricks in the game. Wesley Berg managed three goals and five assists, while Dobbie earned his third hatty in a row also chipping in four assists. Sophmore Holden Cattoni rounded out the trio with three tallies and two assists. Tyler Burton won 17 of 29 face-offs against New England, a continuation of his success after winning more than half of his face-offs in the previous two games. (15-26 against the Stealth, 19-35 against Toronto). He sits third in NLL face-off wins, victorious in 206 of 365 this season. Defender Mitch Wilde has been finding the back of the net lately. He scored a goal and earned an assist against the Black Wolves, after getting one short-handed marker against the Stealth on a breakaway March 31. He’s tallied a career high 18 points this season. For the first time in two games, the Riggers spent more than 10 minutes on the penalty-kill. They found themselves in the box for 12 minutes on six infractions. However, they still managed to improve their overall penalty-kill from fifth-to third-best in the league, at 52.4%.